A live edge fireplace mantel provides a unique alternative to the typical cut-and-polished style of mantels. While typical mantels are smooth, flat and may have elegant designs. A rustic mantel maintains the natural live edge wood. Imagine a log that is flat on top and back for objects to rest on an even surface also known as live-edge or natural edge. 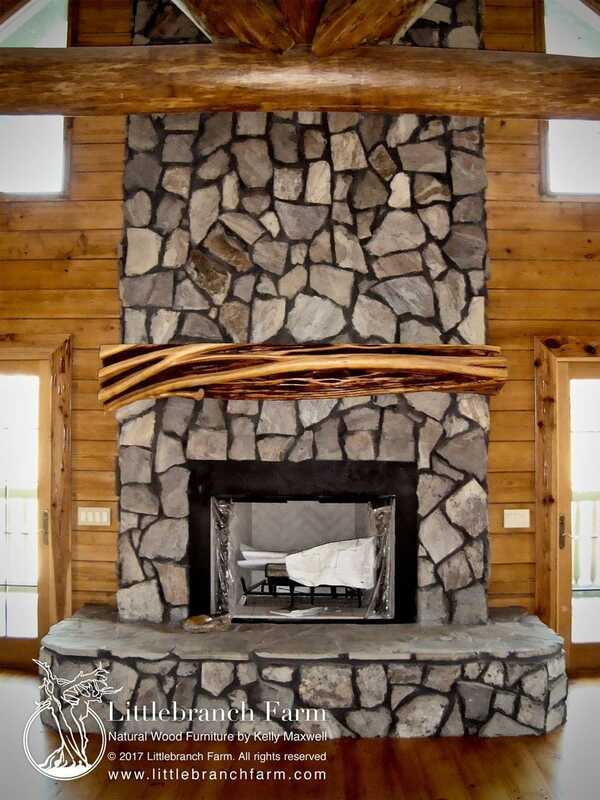 Rustic mantels are perfect for log homes, country decor, beach themes and most any home decor. There are several popular rustic mantel wood types and styles to choose from. They are also complemented by our live edge furniture handmade from salvaged wood native to the Pacific Northwest. Reclaimed wood slab mantel cut from a salvaged old growth redwood harvested from the forest floor. It also is an organic live edge wood slab. 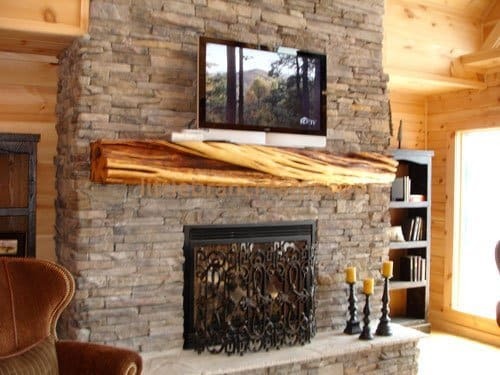 This is a style 0f rustic fireplace mantel are made of twisted juniper logs. They are mostly bone colored or tan colored and have darker knots and twists throughout the log. 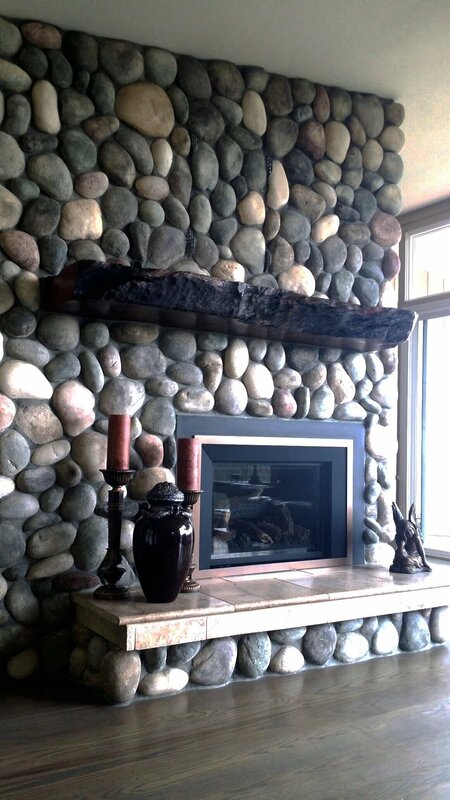 Their live edges complement any fireplace style and make them stand out in a room. Only the finest and most attractive sections of twisted juniper logs are used for these mantels. With a flat top and a narrow length, twisted juniper mantels are perfect for using over a fireplace with a contrasting color or style of wood. The unique twist, knots and color tone make stunning log mantels. 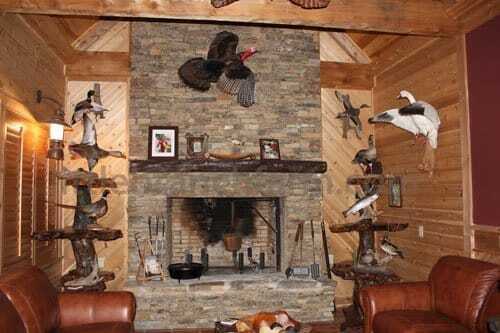 Each of the unique styles of log mantels is one of a kind and are available in many sizes. Driftwood mantels are made from reclaimed or salvaged driftwood. They are available in many shapes and sizes all unique and one of a kind. Reclaimed driftwood mantels come with some slight curves. Their live edges make them attention-grabbing fireplace focal points for any room. Since they usually have dark or reddish colors, these mantels coordinate well with fireplaces that have a contrasting color or fireplaces that have a type of wood in a lighter shade. A live edge fireplace mantel is featured in this room seen with rustic furniture handcrafted by our custom furniture makers. In addition to reclaimed driftwood mantels, there are several types of reclaimed wood that make excellent rustic fireplace mantels. Reclaimed redwood burl has a light but attractive reddish tone. Another appearance that is equally attractive is redwood curl. However, it is a rare curly redwood fireplace mantel can coordinate with nearly any style of fireplace and any type of decor in a room. A knotty redwood fireplace mantel is perfect for a country theme with any style of fireplace. A reclaimed hand hewn beam is another attractive mantel option. It is also a great choice for people who want to keep a country theme but prefer a piece of wood that is a darker brown color without a reddish tone. When buying a rustic fireplace mantel, think about the desired wood type, color tone, burl wood, curl and knots to fit your individual style and home decorating preferences. For high-quality rustic fireplace mantel in a variety of styles, woods types, and sizes, visit LittleBranch Farm studio and choose from our large selection of fireplace mantels made of twisted juniper logs, reclaimed driftwood, eastern red cedar, salvaged redwood burl, barn wood and reclaimed hand hewn beams. Orders can also be custom cut and embellished for a unique rustic mantel.